This ’72 911 T is known as an “oil flap” car for its external oil filler cap on the rear passenger side fender. Porsche moved the oil tank for 1972 to help reduce the weight hung behind the rear wheels and combat complaints of snap oversteer that could catch the inexperienced driver by surprise. The external filler cap resulted in an unforeseen problem when gas station attendants inadvertently filled the oil tank with gas and thus the flap went away by 1973. This particular 2.4 liter 911 has been updated to look like a ’75 930 with wider rear fenders, whale tale, newer bumpers and seats. 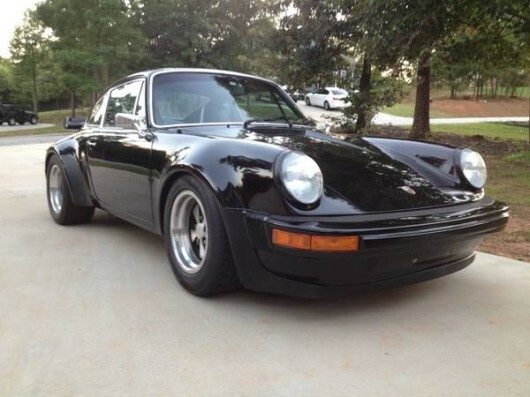 This was a common mod in the ’80’s and while we’re not a fan of it, the result is a good deal on an early 911. Backdate this car with the correct fenders and bumpers and you’ll have a one year only 911 with a value that’s on the up and up.